Yesterday the troll stuck his head out and blinked in bewilderment at the blazing spotlight that was Shimano’s formal unveiling of its revamped, 2013 Dura-Ace groupset. Call it seamless integration or planned obsolescence (it’s the same thing, just different ways of looking at it) what is clear is Shimano has redrawn the battle line when it comes to consumer expectations of a top-end groupset. And when Shimano makes a statement, everyone that has anything to do with bicycling, sits up and listens. Just a month ago, with rumours and spy pics flying all over the internet, I too thought that Shimano’s designers had somehow managed to drop the ball and gift SRAM and Campagnolo an increased market share based on aesthetics alone. And the resurrection of Flightdeck, with a moniker that promised everything of a bicycle computer, only stirred resentment from a cyclist who paid way too much for an electronic gizmo that became less than worthless within a year (the connection to the levers corroded and fused - integrated, as it were, in a way Shimano never intended - so the wires had to be cut to remove the headpiece). But Shimano doesn’t tend to make mistakes. And Di2 has clearly proven itself. The total package, particularly the Di2 9070 electronic gruppo, looks fabulous. And the troll lusts for it. If only Shimano made a saddle and a frame (think enhanced biometrics and direct mount derailleurs and brakeset) then the seamlessly integrated racing bicycle would become a reality. No need for choice nor an aftermarket industry. They are not glamorous. They are not expensive. They are not even that uncommon. Once ubiquitous they are no longer used on modern bicycles. They were used at a time when when you could reasonably expect to pass your bicycle on to your child (along with other things like your books, your music collection, a house that you fully owned, and maybe some moral values). A time when bicycles were made to last and a spare parts catalogue actually meant something (like a spare parts inventory). Things were different then. But things have always been different. And the recollection of a time passed often offers little more than a selective focus based on a current bias. Bicycling has been one of the great achievements of human endeavour and the subject of countless tinkering over the course of its evolution. Customised components? Think Pino Moroni. Bicycle integration? Think Alex Singer and Rene Herse. It's true that the more we look at something the more depth and diversity we tend to see. And bicycles are a great case in point. Some ideas have done their time while others, for now, continue to endure. Think Mikael Pedersen (the Dursley Pedersen bicycle hammock), Alex Moulton (small wheels, rubber suspension and a truss frame), John Boultbee Brooks (leather saddles), the various attempts at shaft-driven bicycles, Nobuo Ozaki (designer of Suntour's slant parallelogram rear derailleur), that group of hippie Californians who brought us the off road “mountain” bike, and that (nameless) guy who gave us lock-on grips so we could hold on to them. 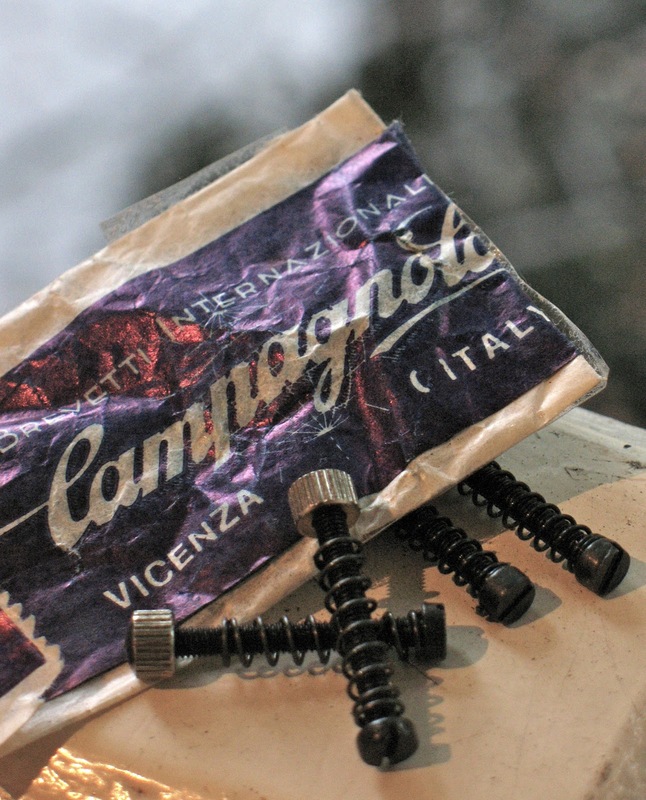 Saying nothing of the innovations brought about by the companies created by Tullio Campagnolo and Shozaburo Shimano. Yesterday, Shimano officially launched Dura-Ace for 2013. There was a time when a need to adjust the rear axle alignment also allowed you to subtly alter the wheelbase of your bicycle. Some find this nostalgic. Most these days (if they even know about it) find this rather quaint. A stroll through Paris. Monday 11 June. A stroll through Paris. Tuesday 12 June.